For the next 3 months, I’ll be living out of a suitcase. I thought it might be fun to follow along with my work wardrobe during this time. It’s a challenge packing everything on Sunday night and just hoping for the best throughout the week. You never know when a big meeting or thunder storm will pop up so sometimes your outfit has to adapt. Yep, I wore a skirt 3 times over the past 2 weeks when it down poured. I hope these looks will give you some ideas on dressing for the week place. I tried to through in a few casual looks with a couple more upscale. I wanted to start out with something funky fresh. Geometric patterned denim jacket was a go! I kept the look professional by sticking with black and white. If you’re going to wear one of your most dress down items in your closet then consider pairing it with your most upscale piece. In this case, it was a belted pencil skirt. That way no one can call you out on being under dressed. I’ve said it once, I’ll say it a hundred times. You can wear black and brown together now! #norules. Since this outfit it simple in color, I added a ruffled top and spiked necklace for visual interest. The cognac and leather add texture into the mix. Again with the pattern here. I really can’t resist, adding pattern makes the outfit visual more appealing with having to sacrifice comfort. This was the most upscale look of the week. The dress is actually more comfortable than pants. It’s super stretchy. The boxy blazer gives a contrast to the form fitting dress. This outfit was for Friday. I had to consider I’d be wearing it from 6 am-6pm during my commute back to Sacramento. I picked my stretchiest pants because my body ends up in all kinds of weird positions during that 2-3 hour drive. Unfortunately, most of these clothing items are old so I can’t link them up. Mainly the intent of this blog space is to inspire new color palettes, silhouette pairings and pattern mixing. Hope you enjoyed! Great looks! Look #3 is my favorite look on you, the cut and color is very flattering. Ps- I just started a new blog. It’s called Mildly Moody and its aimed towards female entrepreneurs and career IT girls. My latest article is about 7 habits holding you back from success. Perhaps you can take a look when you get a chance? 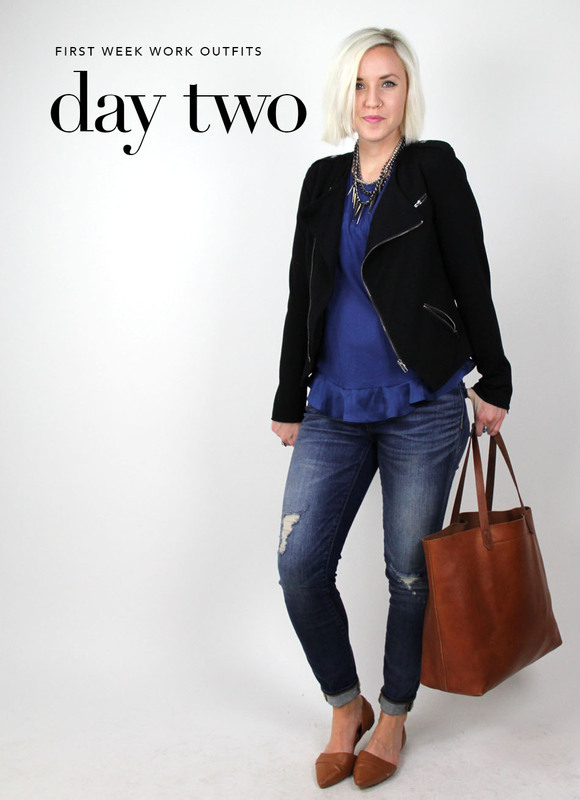 Love these looks and that you are sharing your suitcase stylings with us :). Outfit 1 and 3 are my faves. What a cute jacket in 1 and I love the mix of colors in 3. I like the variety of your outfit choices! The pencil skirt and black dress are perfect pieces! !